Chlorine dioxide products from the AppOx™ series are capable to perform a wide range of functions — including odor control, disinfection, oxidation and sanitation — in water treatment, food plants, cooling towers, healthcare, livestock, and many other applications and markets. In fact, the possibilities of our products go beyond what one would normally imagine for water sanitation and disinfection uses. Some of the uses and applications where our products are employed are listed below. For more details about these and other applications or treatment protocols please contact our Technical Service Department. Whether you find yourself in a hotel bath room, cruise ship cabin, hospital, office building, industrial plant, greenhouse, car wash facility or your own hot tub, the combination of certain temperature levels, stagnant water and the presence of biofilm in water systems is a potential recipe for disaster: an outbreak of Legionnaires’ disease. An outbreak of Legionnaires’ disease is often the result of negligence, having legal repercussions for responsible parties. Because of its chemical and biocidal characteristics, chlorine dioxide is ideal for maintaining good standards of water hygiene. Chlorine dioxide has consistently been demonstrating to be the best molecule for eradicating the causative organism of Legionnaires’ disease. 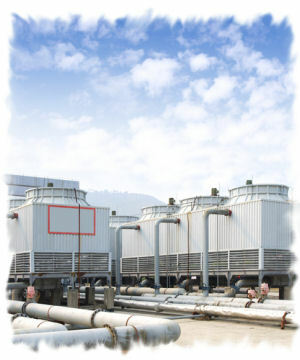 Controlling and preventing the growth of microorganisms in a cooling tower is extremely important and required to keep the system running at optimal levels. The presence of microorganisms will cause the system to breakdown and decreases the efficiency of the heat transfer. Typically oxidizing biocides such as chlorine and bromine have been used to treat cooling water. Unfortunately these chemicals are highly reactive with other chemicals and microbiological species found in the water. Chlorine dioxide however is very non-reactive to other compounds found in the water and retains biocidal efficacy. Likewise it is also a superior chemical for removing the biofilm, which leads to the most predominant problems that all cooling towers face. Most food processing facilities currently use a combination of different chemicals for all surface and machine disinfection. They periodically rotate the use of different sanitizers to prevent the harmful microorganisms from building a resistance to their killing properties. Unfortunately facilities are still experiencing pathogen outbreaks. Chlorine dioxide’s unique killing ability does not allow for the build up of resistance or mutation, and therefore eliminates the need for all of the other chemicals. Chlorine dioxide is effective for use in controlling microbiological growth in flume waters and other food processing water systems such as chill water systems and hydrocoolers. Because of its superior disinfection ability, many applications of chlorine dioxide have been found to be extremely beneficial in the dairy industry. Dosing the drinking water lines has led to the reduction in bacteria in the water and thus decreased the somatic cell count in the milk. Replacing iodine with chlorine dioxide as the active ingredient in teat dips has led to reduced mastitis cases. Using chlorine dioxide as a CIP agent in the milk line disinfection has brought a decrease in the E-coli count found in the milk, thus increasing milk quality. Using chlorine dioxide in cow washes has led to reduction in mastitis, decreased hairy hoof wart cases and overall improved herd health. In broiler and layer farms, drinking water is often acidified to obtain a lower pH in order to stimulate the feed intake of the birds. However, doing so counteracts the efficacy of chlorine, since this most commonly used disinfectant requires a higher rather than a lower pH of the drinking water. Consequently, more chlorine is needed to compensate the diminishing effect caused by the organic acid, which in turn results in uncontrolled (over)dosing. With chlorine dioxide, nothing of this kind occurs since chlorine dioxide functions perfectly between pH 4 and 10. With chlorine dioxide, it is much easier to influence and improve poultry growing conditions. Maintaining a high quality sanitation program to prevent the ingestion of microbiologically contaminated fresh produce is of paramount importance to all food operations. Food contamination can irrevocably undermine consumer confidence, elevate irresponsible financial risk due to product recalls, or even result in loss of life and business. Even a single contaminated batch of food, one poor or erratic output can destroy your company’s reputation. Due to its broad-spectrum anti-microbial activity and versatility, chlorine dioxide is the ideal biocide for every biosecurity program. It may be employed in various applications such as process water, hard surface sanitation and post harvest wash.
Chlorine dioxide has a number of advantages over other biocides commonly used in the fish and fish processing industry. Chlorine dioxide in solution can be added to water/ice that is used in processing and packing any fish. The slow release of chlorine dioxide gas from the water onto the surface of fish as the ice melts helps to prevent spoilage and odors during transport. It maintains the microbial quality of water even in presence of high organic load, thereby impacting upon quality maintenance and substantial improvement of shelf life of the products. Water is one of the single biggest raw materials used in meat processing, and its quality is of great importance to prevent contamination of food product. The use of contaminated water in the processing plant can spread infection across the whole food batch. This is a cause of serious concern to the food industry, consumers and regulatory bodies, besides that, it causes financial losses and food scare. Chlorine dioxide, a very powerful biocide, has a number of advantages over other products commonly used in the meat processing industry. When properly applied, chlorine dioxide can act as a break in contamination thereby reducing/eliminating cross contamination as well as removing superficial microorganisms before they have an opportunity to become attached and penetrate the carcass. Horticultural and greenhouse operations are facing increasing challenges in dealing with sanitation issues related to water treatment. Over the course of growing a crop, pathogenic microorganisms accumulate and algae flourish on moist surfaces posing a constant threat to plants and produce. The main challenges lie the areas of irrigation water, elimination of biofilm and algae control. Existing biocidal products, while effective in killing algae, are not effective in removing biofilm from the water lines. The ultimate solution would be to employ a biocide that is capable to control algae on greenhouse surfaces and strip the biofilm in irrigation lines. Chlorine dioxide has demonstrated to possess both properties. Infections acquired in hospitals are the fourth largest killer in the US. According to statistics from the Centers for Disease Control and Prevention, every year in this country, two million hospital patients contract infections, and well over 100,000 persons die as a result thereof, more fatalities than caused by AIDS, breast cancer and car accidents together. Infections can be prevented and controlled by running rigorous, continuous programs of routine and meticulous cleaning and disinfection of equipment, surfaces and rooms. One of the most effective disinfectants for this job is chlorine dioxide. As a selective oxidizing agent, chlorine dioxide possesses several chemical advantages when compared to the traditional use of chlorine in wastewater treatment. Chlorine dioxide does not hydrolyze in water, and thus it retains its biocidal activity over a broader range of pH. It is also non reactive with ammonia and most nitrogen-containing compounds, and thus effective at lower dose levels than chlorine. It also eliminates phenols, simple cyanides and sulfides by oxidation. Likewise it is effective at odor control and will oxidize sulfides. Chlorine dioxide is also effective at oxidizing iron and manganese compounds. The largest reason many water systems become fouled and work inefficiently is due to the growth of biological film also known as biofilm or slime. Slime grows very quickly in water systems because most standard disinfection chemicals that are added to the water do not prevent the growth of or eliminate slime. The slime consists of two layers. A hard layer is found compacted against the inner wall of the distribution pipe. Within the diameter of the hard layer is a soft slime layer. The soft layer deposits flakes off slime into the water current. The slime deposits block piping systems, foul drinking water nozzles and cleaning sprays, which is a hazard for water quality and public health. Chlorine dioxide is approved by the United States Environmental Protection Agency (US EPA) as an eco-friendly disinfectant which may in some cases complement or even replace chlorine-based disinfection regimes for both the pre-treatment and final disinfection of potable water. Over last decades, chlorine dioxide has found its way to a number of applications in potable water treatment throughout the United States and the rest of the world, which include primary disinfection, taste and odor control, THM and HAA reduction, iron and manganese removal and nitrification prevention in chloramine systems. At Applied Oxidation, we are every day at the forefront of identifying and developing new product market combinations in close cooperation with our team of scientists and application engineers and of course our customers. Our learning, research and development never stops. Applied Oxidation is currently validating a series of new applications, some of which are characterized by our customers as “revolutionary” as they fundamentally defy the sanitation and disinfection conventions of the concerned industry.